It’s a tough market for every one when it comes to finding talent. It doesn’t matter whether you are big or small, but since larger corporations are big enough to look after themselves when it comes to talent attraction strategies, we, from time to time, like to focus articles on helping small firms in their hiring endeavors. One challenge that small employers often face is competing in the same ball park as the big league corporates for talent. In many respects, it’s not an equal playing field as large corporates on the face of it seem eminently more attractive than small businesses offering, cool consumer brands, glamour, higher salaries and benefits to die for. 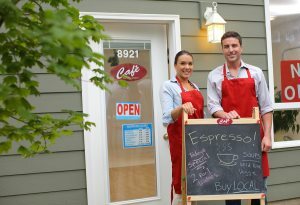 But, small businesses can offer great things too – which larger businesses may not be able to match – and I have outlined four unique aspects of small employers to shout about. The Regus Work-Life Balance Index for 2012 of 16,000 professionals in over 80 countries has found that smaller companies have a much higher work-life balance rating than larger companies at 130 points compared to 109. As well as this, while work-life balance has improved for all sized businesses since 2010, it has grown significantly in the small business arena by a rate of 27 points. The factors that constituted work life balance in this study included: sense of enjoyment, achievement and satisfaction with the amount of time spent at home, along with additional factors, such as working hours and additional duties. So, if candidates want great work-life balance, tell them that small business is the place to be. In the recent 2013 State of the American Workplace report, Gallup examined employee engagement by company size and found that the highest levels of employee engagement by far (42%) were in companies that had less than 10 people, which shows that there is something unique about the tight knitted, family style work environment that drives engagement. So, if you are a micro business, you might want to ‘make some noise’ about the fact that micro businesses are the most engaging places to be. A study by the National Federation of Independent Business of 7,500 small firms has found that 96 percent of small firms allow staff to work flexible schedules and that they don’t usually have a policy but manage requests on a case-by-case basis. So, if flexibility is what you want, small businesses are definitely big league players. In the Delivering Happiness at Work survey which is a 47 question survey asking questions relating to work-life balance, utilization of time on the job and overall feelings while at work, they found that employees in companies with less than 100 employees were generally the happiest. I’d love to hear about any more research based studies looking into the positive aspects of working in a small business.